During the exercise M-40 drones simulated enemy fighter jets and missile attacks and Italian Navy personnel trained its capabilities through the aircraft carrier Cavour and its complement of AV8B+ fighter aircraft alongside the Navy destroyer Mimbelli against the drones at an Italian joint armed forces test range. In particular, the M-40 simulated a missile attacking the Italian naval vessels and separately acted as a hostile enemy fighter in air-to-air combat scenarios. During these realistic scenarios, the Italian Navy personnel were able to ‘shoot down’ the reusable M-40 and thus they could train with weapon systems including Aspide missiles. This exercise was the first set of missions for making use of the M-40. The M-40 is an unmanned air vehicle which convincingly simulates a full spectrum of radar, infrared (IR) and visual threats, including a variety of aircraft and missiles. Thanks to its lower operating costs, the M-40 provided the same level of training as previous exercises at a significantly reduced cost. Leonardo owns and operates the M-40 on behalf of the Italian Armed Forces under a managed service arrangement with the NATO Support and Procurement Agency (NSPA). Alongside the M-40, Leonardo continues to offer the Mirach 100/5, which shares a ground control station with the new M-40 and was also part of the Italian Navy exercise. 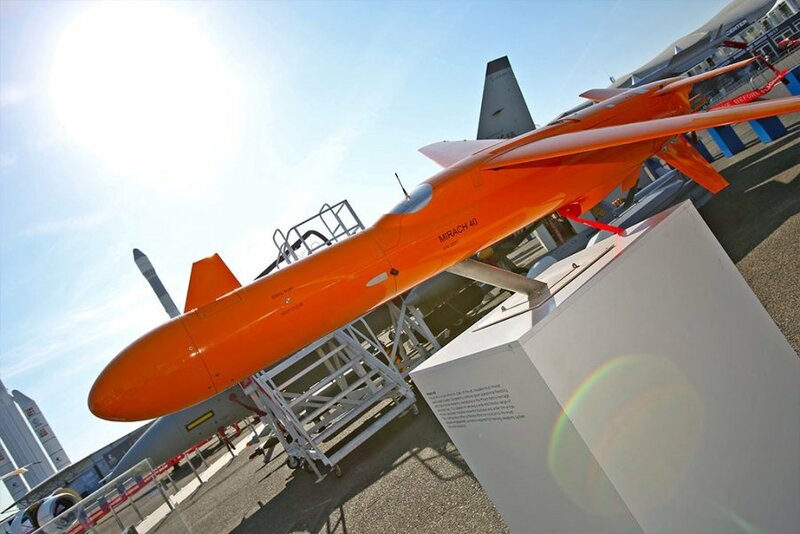 The Mirach 100/5 target drone has been operated by Leonardo for 20 years under a managed service arrangement for the Italian Armed Forces and provided for a number of export customers. Now, the new low cost M-40, which has 60 minutes endurance, is being used to supplement the capability of the Mirach 100/5.